There are some interesting changes happening in technology, which will likely fundamentally change how IT approaches technology like Enterprise Service Buses (ESBs) and concepts like Service Oriented Architecture (SOA). Let’s take each in turn, and conclude by suggesting how this will impact how ESBs and SOA will likely evolve. Historically, IT has an inconsistent record with respect to data governance. For sure, each application often had dedicated data modellers or designers, but its data architecture tended to be very inward focused. Integration initiatives tended to focus on specific projects with specific requirements, and data was governed only to the extent it enabled inidividual project objectives to be achieved. Sporadic attempts at creating standard message structures and dictionaries crumbled in the face of meeting tight deadlines for critical business deliverables. ESBs, except in the most stable, controlled environments, failed to deliver the anticipated business benefits because heavy-weight ESBs turned out to be at least as un-agile as the applications they intended to integrate, and since the requirements on the bus evolve continually, application teams tended to favour reliable (or at least predictable) point-to-point solutions over enterprise solutions. The security/privacy agenda is the most visible, as organisations are extremely exposed to reputational risk if there are security breaches. An organisation needs to know what data it has where, and who has access to it, in order to ensure it can protect it. Digital transformation means that every process is a digital-first process (or ‘straight-through-processing’ in the parlance of financial services). Human intervention should only be required to handle exceptions. And it means that the capabilities of the entire enterprise need to be brought to bear in order to provide a consistent connected customer experience. For regulated industries, government regulators are now insisting that firms govern their data throughout that data’s entire lifecycle, not only from a security/privacy compliance perspective, but also from the perspective of being able to properly aggregate and report on regulated data sets. The same governance principles, policies, processes and standards within an enterprise should underpin all three drivers – hence the increasing focus on establishing the role of ‘chief data officeer’ within organisations, and resourcing that role to materially improve how firms govern their data. Microservice technology is an evolution of modularity in monolithic application design that started with procedures, and evolved through to object-oriented programming, and then to packages/modules (JARs and DLLs etc). Along the way were attempts to extend the metaphor to distributed systems – e.g., RPC, CORBA, SOA/SOAP, and most recently RESTful APIs – in addition to completely different ‘message-driven’ approachs such as that advocated by the Reactive Development community. 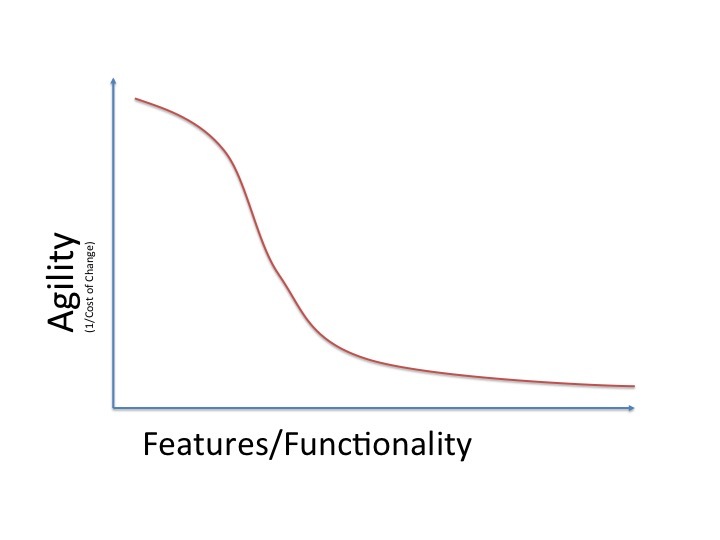 Unfortunately, until fairly recently, most applications behind distributed end-points were architecturally monolithic – i.e., complex applications that needed to go through significant build-test-deploy processes for even minor changes, making it very difficult to adapt these applications in a timely manner to external change factors, such as integrations. The microservices movement is a reaction to this, where the goal is to be able to deploy microservices as often as needed, without the risk of breaking the entire application (or of having a simple rollback process if it does break). In addition, microservice architectures are inherently amenable to horizontal scaling, a key factor behind its use within internet-scale technology companies. So, microservices are an architectural style that favours agile, distributed deployment. As such, one benefit behind the use of microservices is that it allows teams, or individuals within teams, to take responsibility for all aspects of the microservice over its lifetime. In particular, where microservices are exposed to external teams, there is an implied commitment from the team to continue to support those external teams throughout the life of the microservice. A key aspect of microservices is that they are fairly lightweight: the developer is in control. There is no need for specific heavyweight infrastructure – in fact, microservices favor anti-fragile architectures, with abundant low-cost infrastructure. Open standards such as OSGi and abstractions such as Resource Oriented Computing allow microservices to participate in a governed, developer-driven context. And in the default (simplest) case, microservices can be exposed using plain-old RESTful standards, which every web application developer is at least somewhat familiar with. Combining the benefits of both data governance and microservices means that firms for the first time can start buiding up a real catalog of enterprise-re-usable building blocks – but without the need for a traditional ESB, or traditional ESB governance. Microservices are developed in response to developer needs (perhaps influenced by Data Governance standards), and Data Standards can be used to describe, in an enterprise context, what those (exposed) microservices do. Because microservices technologies allow ‘smart endpoints’ to be easily created and integrated into an application architecture, the need for a central ‘bus’ is eliminated. Developers can create many endpoints with limited complexity overhead, and over time can converge these into a small number of common services. With respect to the Service Registry function provided by ESBs, the new breed of API Management tools may be sufficient to provide any lookup/resolution capabilities required (above and beyond those provided by the microservice architecture itself). API Management tools also keep complexity out of API development by taking care of monitoring, analytics, authentication, protocol conversion and basic throttling capabilities – for those APIs that require those capabilities. Culturally, however, microservices requires a collaborative approach to software development and evolution, with minimum top-down command-and-control intervention. Data governance, on the other hand, is necessarily driven top-down. So there is a risk of a cultural conflict between top-down data governance and bottom-up microservice delivery: both sides need to be sensitive to the needs of the other side, and be prepared to make compromises occasionally. In conclusion, the ESB is dead…but long live (m)SOA. The idea that the benefits embodied in a microservices approach to solution architecture is relevant to enterprise architecture is a solid one. In particular, it allows bottom-up, demand-driven solution architectures to evolve, while providing a useful benchmark to assess if those architectures are moving in a way that increases the organization’s ability to manage overall complexity (and hence business agility). Microservices cannot be mandated top-down the same way Services were intended to be. But fostering a culture and developing an IT strategy that encourages the bottom-up development of microservices will have a significant sustainable positive impact on a business’s competitiveness in a highly digital environment. I fully endorse all the points Gene has made in his blog post. We need to get beyond thinking of design as just a do once, up-front sort of thing. If we re-orient to design as something we do at different levels (strategic, system-in-context, system, elements and mechanisms, algorithms, …), at different times (including early), and iteratively and throughout the development and evolution of systems, then we open up the option that we (can and should) design in different media.